When I was a pastor, the question of our title was once asked of me by a couple of Christians who simply did not know how their local PCUSA church, which had been started by their Scottish and Irish ancestors, could have sunk so low in its adherence to the Bible. It was the beginning of a spiritual journey by them into the Presbyterian Church in America. Certainly there were many instances of spiritual departure all through the early years of Presbyterianism in America, many of which have been discussed on this blog since we began in 2012. 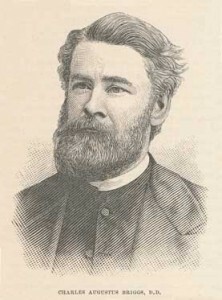 But the real and damaging departure into apostasy, which continues today, came with the introduction into theological liberalism by Charles Augustus Briggs. 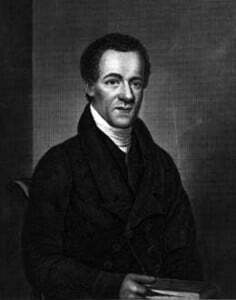 He was the first major advocate of Higher Criticism into the American Presbyterian scene. As American theological students finished their training here and then went to Europe for advanced training, they were introduced there to liberal ideas regarding Holy Scripture. The question was simply stated: “Were the Scriptures of the Old and New Testaments inspired of God, the only infallible rule of faith and life, without error in the original languages?” Higher Criticism concluded that the Bible was not inspired, inerrant, and infallible. And so Charles Briggs studied under their Bible-denying ideas in Germany, 1866-69, and returned to America, eventually taking a post teaching Hebrew at Union Theological Seminary in New York, 1874-91, and then becoming the school’s new Professor of Biblical Theology. He was inaugurated as Professor on this day, January 20, in 1891. In his opening address to the seminary, he boldly set forth his denial of the inspiration of the Old and New Testaments. While this seminary of the Presbyterian Church was friendly to this new view, the denomination was not. Led by the conservative theologians of Princeton Theological Seminary, like A.A. Hodge, the General Assembly refused to accept that appointment. Twice he would be tried by the New York Presbytery of the denomination for heresy, and twice the regional body would declare him not guilty of errors. Soon the denomination entered by appeal into the issue, and two years later, deposed him, assessing him as a heretic with his denial of Scriptures. He joined the Episcopal church, and continued on at Union Seminary. Union Seminary kept the polarizing figure by withdrawing from the Presbyterian denomination. However, the latter continued to receive into its ranks graduates of Union Theological Seminary. By 1924, the Auburn Affirmation was published, as has been described in other posts on this blog. The modern apostasy had begun in the church with this denial of Scripture. Once Scripture is denied, then other biblical truths fall by the wayside in both doctrine and practice. The first ordination vow of the Presbyterian Church in America reads, “Do you believe the Scriptures of the Old and New Testaments, as originally given, to be the inerrant Word of God, the only infallible rule of faith and practice? Every teaching and ruling elder, to say nothing of deacons in the church, must adhere to this vow. Our presbyteries and the General Assembly must seek to keep the church pure in doctrine. If we do not, then present and future members might be asking how our church has became so theological liberal in faith and life. Let us learn from the past and remain true to the inspired, inerrant, and infallible Word of God, the Bible. Let me zero in on the expression above “after much coldness and insensibility of heart.” Reader, if you attend a Bible-believing Presbyterian Church, please be aware that your pastors are men of like passions as you are. They are flesh and blood believers, albeit men trained by both life and education to handle the Word of God in pulpit and in homes. Sometimes, the people in the pew expect too much of them, demanding every moment of their time. This is seen in the pastoral schedules that the members of the church demand that they keep. This author began his pastoral ministry in this country in a smaller congregation. It was expected of me to preach two sermons on the Lord’s day, besides teaching an adult Sunday School class and leading the youth group that Sunday evening. Once a quarter, the church had committed to a rest home service, where another sermon was expected. Then of course, the Wednesday night study and prayer time, a Bible study during the week in the home, visitation to hospitals and homes were regularly required. I can understand Daniel Baker’s acknowledgment of “much coldness and insensibility of heart” on occasions during that pastorate. 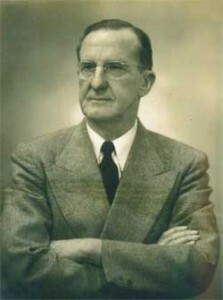 To our subscribers of This Day in Presbyterian History, understand that your pastor’s role in the church from both the pulpit and to the pew is for “the equipping of the saints for the work of service, to the building up of the body of Christ.” (See Ephesians 4:11 – 12) The more spiritual equipping which is done in the body of Christ will cause the congregation to join him in the great spiritual work of that local church to itself, to the community, to your state, and to the world. Even the atheist Mencken, who often wrote caustically against those who held the Christian faith, actually defended Machen’s stance. After a cogent analysis of Machen’s argument, he completely sided with him, saying: “The body of doctrine known as Modernism is completely incompatible, not only with anything rationally describable as Christianity, but also with anything deserving to pass as religion in general” (Mencken, 1937, p. 15). Furthermore, he said, the efforts of modernists to square their positon with the faith in the Bible “is a vain enterprise” (1937). Mencken concluded by saying that though Machen tried to persuade his fellow Presbyterians throughout his career, “he failed–but he was undoubtedly right” (1937). My interest in Dr. Machen while he lived, though it was large, was not personal, for I never had the honor of meeting him. Moreover, the doctrine that he preached seemed to me, and still seems to me, to be excessively dubious. I stand much more chance of being converted to spiritualism, to Christian Science or even to the New Deal than to Calvinism, which occupies a place, in my cabinet of private horrors, but little removed from that of cannibalism. But Dr. Machen had the same clear right to believe in it that I have to disbelieve in it, and though I could not yield to his reasoning I could at least admire, and did greatly admire, his remarkable clarity and cogency as an apologist, allowing him his primary assumptions. These assumptions were also made, at least in theory, by his opponents, and thereby he had them by the ear. Claiming to be Christians as he was, and of the Calvinish persuasion, they endeavored fatuously to get rid of all the inescapable implications of their position. On the one hand they sought to retain membership in the fellowship of the faithful, but on the other hand they presumed to repeal and reenact with amendments the body of doctrine on which that fellowship rested. In particular, they essayed to overhaul the scriptural authority which lay at the bottom of the whole matter, retaining what coincided with their private notions and rejecting whatever upset them. Upon this contumacy Dr. Machen fell with loud shouts of alarm. He denied absolutely that anyone had a right to revise and sophisticate Holy Writ. Either it was the Word of God or it was not the Word of God, and if it was, then it was equally authoritative in all its details, and had to be accepted or rejected as a whole. Anyone was free to reject it, but no one was free to mutilate it or to read things into it that were not there. Thus the issue with the Modernists was clearly joined, and Dr. Machen argued them quite out of court, and sent them scurrying back to their literary and sociological Kaffeeklatsche. His operations, to be sure, did not prove that Holy Writ was infallible either as history or as theology, but they at least disposed of those who proposed to read it as they might read a newspaper, believing what they chose and rejecting what they chose. In his own position there was never the least shadow of inconsistency. When the Prohibition imbecility fell upon the country, and a multitude of theological quacks, including not a few eminent Presbyterians, sought to read support for it into the New Testament, he attacked them with great vigor, and routed them easily. He not only proved that there was nothing in the teachings of Jesus to support so monstrous a folly; he proved abundantly that the known teachings of Jesus were unalterably against it. And having set forth that proof, he refused, as a convinced and honest Christian, to have anything to do with the dry jehad. This rebellion against a craze that now seems so incredible and so far away was not the chief cause of his break with his ecclesiastical superiors, but it was probably responsible for a large part of their extraordinary dudgeon against him. The Presbyterian Church, like the other evangelical churches, was taken for a dizzy ride by Prohibition. Led into the heresy by fanatics of low mental visibility, it presently found itself cheek by jowl with all sorts of criminals, and fast losing the respect of sensible people. Its bigwigs thus became extremely jumpy on the subject, and resented bitterly every exposure of their lamentable folly. The fantastic William Jennings Bryan, in his day the country’s most distinguished Presbyterian layman, was against Dr. Machen on the issue of Prohibition but with him on the issue of Modernism. But Bryan’s support, of course, was of little value or consolation to so intelligent a man. Bryan was a Fundamentalist of the Tennessee or barnyard school. His theological ideas were those of a somewhat backward child of 8, and his defense of Holy Writ at Dayton during the Scopes trial was so ignorant and stupid that it must have given Dr. Machen a great deal of pain. Dr. Machen himself was to Bryan as the Matterhorn is to a wart. His Biblical studies had been wide and deep, and he was familiar with the almost interminable literature of the subject. Moreover, he was an adept theologian, and had a wealth of professional knowledge to support his ideas. Bryan could only bawl. It is my belief, as a friendly neutral in all such high and ghostly matters, that the body of doctrine known as Modernism is completely incompatible, not only with anything rationally describable as Christianity, but also with anything deserving to pass as religion in general. Religion, if it is to retain any genuine significance, can never be reduced to a series of sweet attitudes, possible to anyone not actually in jail for felony. It is, on the contrary, a corpus of powerful and profound convictions, many of them not open to logical analysis. Its inherent improbabilities are not sources of weakness to it, but of strength. It is potent in a man in proportion as he is willing to reject all overt evidences, and accept its fundamental postulates, however unprovable they may be by secular means, as massive and incontrovertible facts. These postulates, at least in the Western world, have been challenged in recent years on many grounds, and in consequence there has been a considerable decline in religious belief. There was a time, two or three centuries ago, when the overwhelming majority of educated men were believers, but that is apparently true no longer. Indeed, it is my impression that at least two-thirds of them are now frank skeptics. But it is one thing to reject religion altogether, and quite another thing to try to save it by pumping out of it all its essential substance, leaving it in the equivocal position of a sort of pseudo-science, comparable to graphology, “education,” or osteopathy. That, it seems to me, is what the Modernists have done, no doubt with the best intentions in the world. They have tried to get rid of all the logical difficulties of religion, and yet preserve a generally pious cast of mind. It is a vain enterprise. What they have left, once they have achieved their imprudent scavenging, is hardly more than a row of hollow platitudes, as empty as [of] psychological force and effect as so many nursery rhymes. They may be good people and they may even be contented and happy, but they are no more religious than Dr. Einstein. Religion is something else again–in Henrik Ibsen’s phrase, something far more deep-down-diving and mudupbringing, Dr. Machen tried to impress that obvious fact upon his fellow adherents of the Geneva Mohammed. He failed–but he was undoubtedly right. 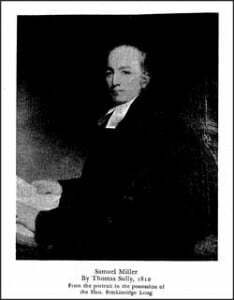 The next man called by the congregation in 1829 was the Rev. Theodore S. Wright (pictured at right), trained in part at Princeton Seminary and licensed to preach by the Presbytery of Albany. Under his leadership the congregation was able to obtain the former German Lutheran church at Frankfort and William Streets and from that time forward, until Rev. Wright’s death in 1847, the congregation prospered. Together with Samuel Cornish, Rev. 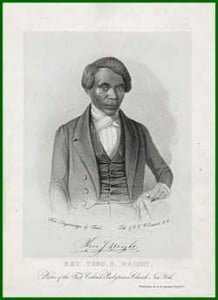 Wright was in 1833 one of the founders of the American Anti-Slavery Society, and served on its executive committee until 1840. Leaving that post, he next worked with fellow abolitionists to begin the American and Foreign Anti-Slavery Society, and also served to chair the New York Vigilance Committee which worked to prevent the kidnapping of free blacks who were then being sold into slavery. In conjunction with these efforts, he opened his home as a station on the Underground Railroad. Time does not permit us here to tell at length their full stories, and I hope you will search out the matter further and read more about Rev. Cornish and Rev. Wright. There is much that we can learn from their ministries, and I don’t pretend that we have done them justice with the above brief account, other than to make you aware of them. Do you love the Lord Jesus Christ? Is there a more important question? It is only when we are drawn to Christ and find forgiveness of our own sin that we can then offer hope and resolution to a sin-sick world. But lest those words become glib, remember that the Christian life is a sacrificial life, meant to be expended on behalf of others as we point a dying world to the only true Savior. The cost is real, but so is the Life. Dr. Green continued to write that “under the divine blessing, it has served to enlighten and instruct the youth in their duty; it has rendered their minds solemn and tender beyond what they were themselves aware of at the time, it has given them a deep reverence for the truth of divine revelation, it has gratified them to hear preaching with advantage, and at length, revealed truth has, we trust, been powerfully and effectually applied to their consciences, by the Spirit . . . . 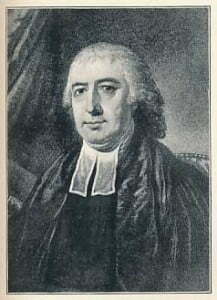 The Presbyterian clergyman/college president went on to write of “their attendance at public worship” for the second means, as “favorable to their religious improvement.” He went on to state “the modes of conducting public worship must be considered as being a powerful instrumental cause, both in producing an awakened attention to religion at first, and in cherishing it through the whole of its progress. The effect of moral discipline, Dr. Green observed in this report to the trustees, “has been manifestly favorable to this revival.” Evidently, three students had been dismissed from the student body for conduct unbecoming to the biblical base of the college. The effect of that was used by the Spirit of God to impress upon the students the importance of godly living. Lastly, Dr. Green commends the few pious youth (remember only 12 students in the whole college) who prayed for revival and then happily sought to impress upon their fellow students the claims of Christian living upon their lives. The entire report is a remarkable survey of revival in the early eighteen hundreds at this Presbyterian college. What stands out to this author is that there is nothing new under the sun, so to speak, for their day or for ours. All of our Presbyterian entities – colleges, seminaries, local churches, sessions, boards of deacons, presbyteries, and yes, even general assemblies, have access to the same means mentioned in this report to the college trustees. The Psalmist David gave us our marching orders via a prayer for revival of ourselves and those of our relationships in Psalm 85:6 “Will You not Yourself revive us again, That Your people may rejoice in You?” Personalize this text . . . by praying it for yourself, for your family, for your local congregation, for your Presbytery, and yes, for your General Assembly!